Power of One – Follow my adventures of sailing aboard Power of One. Follow my adventures of sailing aboard Power of One. Here you can see the sleek lines of Power Of One – beautiful! She’s back home and out of the water to shelter from the upcoming hurricane season, which is usually June to November in the Atlantic, but big storms do sometimes come through much earlier too. So Donald and Power Of One have added another 1600nm to their tally and arrived home in Savannah, Georgia. Well done! I had quite a scare this afternoon when I checked on their position as the little ‘SPOT’ device that plots the boat’s position, and sends it to the progress map, reported the last update some 4hrs prior to the time I checked. I sent Donald a text to ask if everything was okay and I had no reply from him. I know he doesn’t communicate that much out there over the satellite phone but once a few hours had passed, and still no response, I started worrying a bit. So I thought I might be able to find him via his AIS (Automatic Identification System) device which sends a position to a central database, and is used by maritime vessel tracking systems as a supplement to marine radar. Marine vessels can see other marine vessels plotted on their navigation systems via the AIS position, so very handy to have for safety – if it is switched on. There are a number of online websites that you can view the AIS positions of ships and boats in real-time, I use Marine Traffic mostly. Unfortunately Donald’s navigation software, Adrena, still wasn’t working from having failed during the Rhoute du Rhum race, so that meant his AIS wasn’t working either as they are linked together. So I couldn’t see him but then I started looking for other marine traffic that may have been in the vicinity of where his last reported position was. This is when I got a fright as you will see from the image below that one of those big, closed vehicle cargo carriers – RORO I think it’s called, for Roll-On/Roll-Off – looked as though it had crossed very close at the time when and where his last position had been reported! 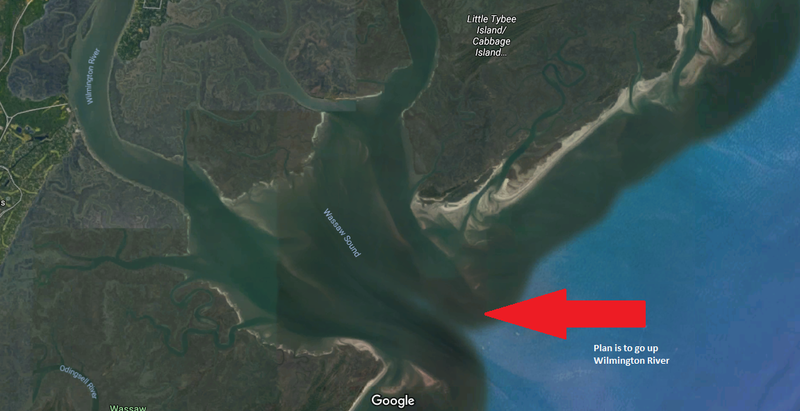 Donald’s last reported position on SPOT looked to coincide with the Track of a large cargo carrier! Author powerofonesailingPosted on March 13, 2019 Categories Under SailTags Atlantic, Finish, Logbook, Power of One, Savannah1 Comment on Home safe! This was the position as at 3-12-19, 23:45pm (GMT-4). Donald has around 100nm to go to the finish, but has to hang around for awhile to wait for the tide to turn so he can navigate the shallows of the river entrance. Frustrating for him I’m sure! Debra had mentioned that there were storms forecast in Tennessee that would hit the East Coast. Donald not too keen on any more storms after the storms he had on the Rhoute du Rhum, but looking at the weather maps, anything that hits him should be a breeze by comparison to those! You may recall that the AutoPilot wasn’t working during the race so he said it was “Bliss” to be able to let Power Of One sail on her own again now that AP is working again. Donald set off from Gaudeloupe on 6 March to take Power Of One back home to Savannah, Georgia. It always takes a few days to settle into the sailing routine and as usual, for Donald, there was some seasickness to overcome. Unfortunately that meant he spent quite a bit of time on deck which resulted in some heatstroke and dehydration! “Barrelling along at 10 knots in 15 knots of breeze. No fireworks but heading straight for Savannah, and hopefully there in time for incoming tide. Yesterday and last night was just squall after squall. Fortunately got spinnaker down yesterday evening before bad stuff hit. Today much more pleasant. 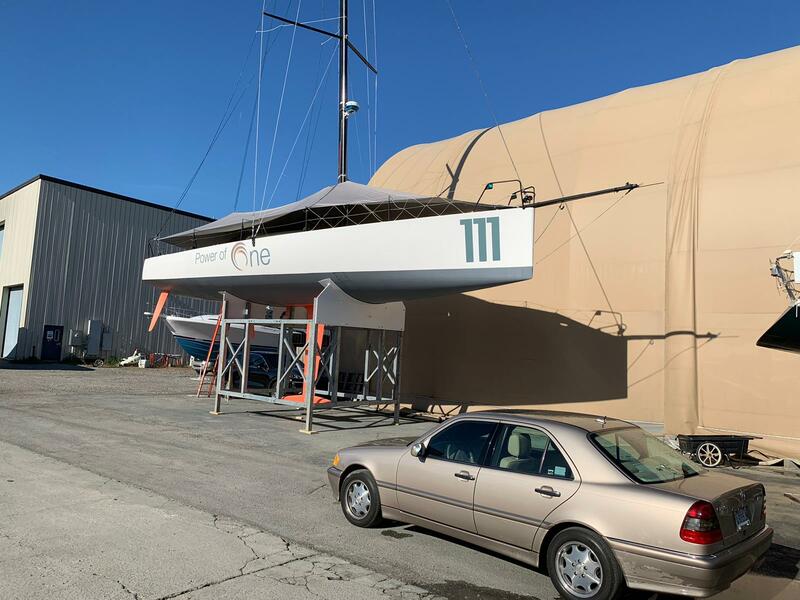 Donald and Power Of One are on the move again after Power Of One has been laid up in Guadeloupe since the finish of the 2018 Route du Rhum – Destination Guadeloupe. Donald arrived back on the boat in Guadaloupe on 24 February 2019 to assess the damages suffered during the race and to start readying her for the trip back to Savannah, Georgia. There had been some keel damage leaving La Coruna after the storm damage repairs were done so the plan was to take her out of the water and inspect the keel. As you can see there was some damage to the fairing of the keel box so that needed to be repaired. On 4 March the new VMHU (vertical masthead unit) weather instrument, and a new fuse box for the Efoy solar power fuel cell system arrived. For those that followed the race, you may recall that during the storms Donald lost three VMHU units due to them being ripped off by the intense winds!